Tempted to pull the comforter over your head and not emerge until spring? You’re not alone. But getting active is the best antidote for cabin fever — for you and your pet. 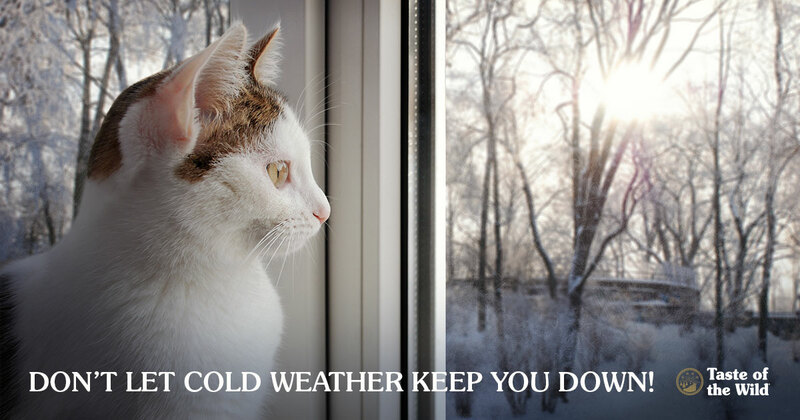 A little cold weather exercise can help keep your pet in good physical shape. So here are some ideas to get your pet up and moving when the mercury tumbles. If you bundle up your dog, there’s no reason he or she can’t go dashing through the snow with you. For dogs with thin coats or hairless breeds, look for a warm, comfortable coat that allows for easy limb movement. Make sure to trim the hair between the pad pads so it doesn’t collect ice balls. If your dog will tolerate booties, they can help prevent the buildup of snow, ice and potentially toxic ice melts used on roads and sidewalks. If not, rinse and towel off your dog’s paws once you come indoors. Have a dog that needs to burn off a lot of energy? Take up skijoring. For this sport, you cross-country ski while your dog runs ahead of you on a harness that is clipped to your waist. Doggie daycare — Drop your dog off for an action-packed day of chase with other like-minded mutts. Or invite one of your dog’s favorite pals over for a play date. Chances are, your dog will wear out and sleep soundly all night. Cat trees — Help your cat stretch those muscles with a multi-level cat tree. Most cats love to be above the action, especially when they can watch the bird feeder outside the window. Treadmills — If you’re not going to use it, your dog might as well hop on it. Start slowly with your dog on a leash and provide plenty of treats. Then work your way up to longer sessions each day. It’s a good, low-impact exercise to help maintain muscle mass and range of motion. Laser pointers — Both cats and dogs love chasing that fast-moving dot around the room. Try building an obstacle course so your pet can run, leap and stretch while in pursuit. Food Puzzles — Pets may not have to hunt for their own food, but there’s no reason they can’t work for it. Place some kibble inside a food puzzle and let your dog or cat put its mind and paws to work. You can even split up your cat’s kibble and hide it around the house so it has to walk from room to room to find it. Toys — Even if you’re watching TV, you can exercise your pets with a game of fetch. Few dogs or cats can resist a tennis ball or catnip mouse arcing through the air. Or tie a toy to a string and draw it across the floor to bring out your pet’s predatory drive. Of course, exercising your pet is only part of the challenge. But once you get them off the couch, it’s easier to get yourself moving, too.